A young star with planets forming, illustrated here, may retain chemical clues about the worlds that surround it. Since the discovery of planets outside our solar system in the 1990s, astronomers have tallied more than 400 extrasolar worlds, many unlike anything known before. Two recent studies show that the formation of planets may leave detectable chemical signatures in their host stars, a finding that could help scientists zero in on planetary systems even more quickly and speed the search for worlds similar to Earth. A team led by astronomer Garik Israelian of the European Southern Observatory recently examined nearly 500 stars, including 86 with planets, and found that most of the planet-bearing stars contained very little lithium, a trait they share with our sun. Astronomers had previously regarded our sun as peculiar for its dearth of lithium. The element leaves a clear signal in the light of a star, so Israelian’s results provide an efficient way to sort through large numbers of stars and decide which ones to focus on for the more detailed studies needed to find planets. “If you have 50 candidates, you can immediately pick out the best,” he says. Jorge Meléndez, an astronomer at the University of Porto in Portugal, has turned up a different indicator of planets. Meléndez identified 15 elements that are more abundant in sun-size stars with giant planets orbiting very close to the stars. But these elements are scarce in our sun, which hosts distant giants and small, rocky inner planets. 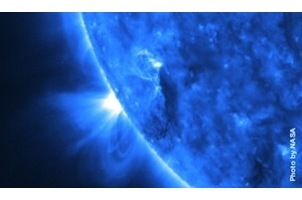 A chemical signature like the sun’s could be a clue to finding Earth-like worlds that could potentially support life.